The '90s Zone: Dairanto Smash Bros.! Excuse the very weeaboo title. Super Smash Bros. came out at the turn of the millennium but quite literally captures some of the most famous gaming worlds of the past few decades. 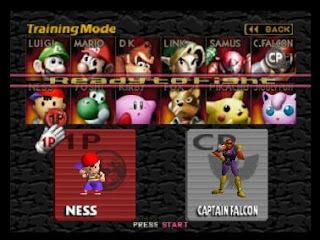 The classic beat-em'-up fighter features combatants from eight distinct universes, including Mother, Pokemon, F-Zero, Mario, Zelda, Star Fox, Metroid, and Kirby. The quirky, campy, and certainly over-the-top style pays homage to the decade's most controversial series, the Mortal Kombat, with its mixture of character taunts, special moves, and zealous announcer. The plot - undeniably silly - involves an evil hand bringing to life dolls of our heroes, and their subsequent rebellion against the master hand and his faithful servants. Smash Bros. actually was supposed to have a lot more than it did, a lot of which got put into Melee then Brawl. 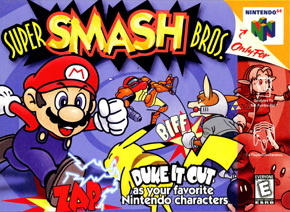 Notable things included a playable Dedede, Mewtwo, and Bowser, plus the famous Final Smashes which made their way to the current chapter of the series. You can actually find Ness's voice records of PK STARSTOOOOOOOOOOOORM in the sound test. I have a couple of childhood memories of the series. The first time I ever played it was at a block party two doors down. While all the adults were busying barbequing, drinking, and swimming, us kids were enamoured by the allure of fighting as our superstars. I only played a few rounds but I remember them fondly. The next was having the game and the N64 to play it rented to us for the weekend. Back in the day Blockbuster used to let you borrow consoles along with games. I don't know how that would fly in the era of gamertags and achievements though. Maybe that's why they went bankrupt (WRONG: it's because Netflix and Redbox driving them out of business. $$$$$). The last memory is the most lingering, and that's of going to a buddy's house for a night of mischief and shenanigans. At the time we weren't allowed being up late and only got to play the game for a few hours, with his kid sister interrupting constantly wanting to play as "dat monkey". But once he fell asleep, two of my other friends and I fired up the N64 and did a 99-stock match on Sector Z. We finished it.